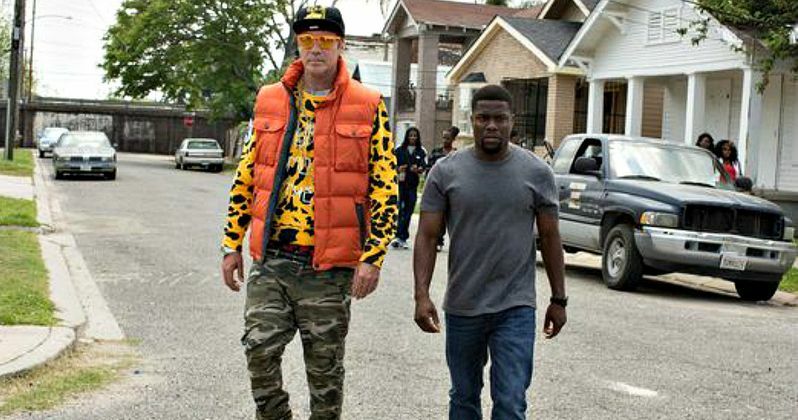 Will Ferrell is going to prison in the new comedy Get Hard, and enlists the help of comedian Kevin Hart to prepare him for the experience. USA Today has our first look at this March 2015 release with a set of three photos that include both actors. Will Ferrell stars as white-collar criminal James King, a Bernie Madoff clone who gets busted for embezzling millions of dollars. Fed up with seeing these types of men go mostly unpunished, a hardened judge decides to send King off to San Quentin. In a panic, the convicted felon decides to enlist the help of a career criminal to help get him ready for his extended stay behind bars. Only problem is, he's picked the wrong man for help, a car washer with no prior record. "I wrongly assume he has a criminal record. And before he punches me in the face for that, I offer him too much money to say no. Darnell is pretending to be a thug so he can help his family to a better life. That's the leaping-off point." "Come on, man, you have Will Ferrell and Kevin Hart, you know doggone well we're not staying on the script. There was tons of improv. Sometimes it would fall flat, and then we'd nail it - home run." Check out the two comedians as they prepare for their stretch of hard prison time in Get Hard.